Seventy years ago on this day, Wednesday, July 15, 1942 (during the Battle of the Atlantic three merchant ships were sunk): Dispersed from Convoy OS-33 the British steam tanker British Yeoman was torpedoed and sunk by U-201; Dispersed from Convoy OS-33, the British steam merchant Empire Attendant was torpedoed and sunk by the U-582; and Sailing with Convoy KS-520, the Nicaraguan motor merchant Bluefields was torpedoed and sunk by the U-576. A few days before, on July 12, Convoy OS-33 (41 ships, 8 escorts) was attacked by 6 U-boats in wolfpack Hai (Shark). Eight ships were sunk, including the British Yeoman and Empire Attendant noted above. There were no survivors on the Empire Attendant. There were 70 U-Boats at Sea (Events this day - U-Boat Net). Off of Cape Hatteras Convoy KS-520 was engaged by U-576. Besides the Bluefields (sunk, noted above) two other ships were damaged: the American ship Chilore (eventually it sunk on July 24) and the Panamian ship J.A. Mowinckel. 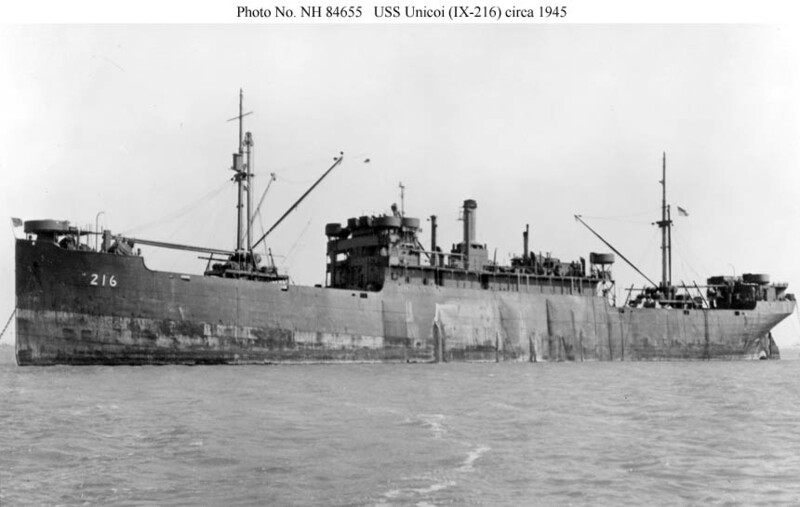 The unlikely hero was the US Navy Auxiliary Ship Unicoi, IX-216 (pictured above). The gunners on the Unicoi managed to damage U-576 (the U-boat was sunk later in the day by aircraft). Also - Field Marshal Erwin Rommel's Afrika Korps and the British 8th Army are engaged in a major battle at El Alamein, Egypt. The Destroyer Escorts USS Stewart (DE-238) and USS Sturtevant (DE-239) were laid down at the Brown Shipbuilding Houston.